Bella's Beauty Spot: Eucerin Daily Protection Review + Giveaway $125 Visa Gift Card! Eucerin Daily Protection Review + Giveaway $125 Visa Gift Card! Most of you know as I've mentioned in previous posts, I grew up on Eucerin. My mom always had it in her bathroom cabinets, and it was always used for dry skin both on our body and face. 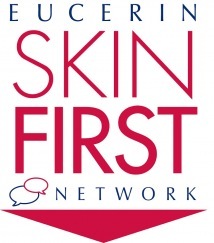 I'm so excited to be part of the Eucerin Skin Network, an exclusive blogging program that allows me to write about new Eucerin products each month, and also give away fabulous prizes to my readers! 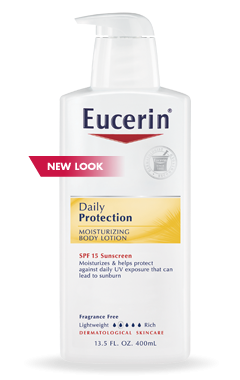 So this month I introduce to you the new look of the Eucerin Daily Protection Moisturizing Body Lotion. Help protect skin from daily sun exposure with a lotion specifically formulated to moisturize and protect. I've been using this at night, every night to keep my skin soft and ready for the next day. I love the look of the new updated bottle. I love the pump vs the other types of lotion bottles because there is no mess, and you only get a little at one time so you're not wasting the product. I think one of my favorite parts about Eucerin's lotions is they are never greasy and they last all day. 2 pumps and the lotion goes on like silk, and leaves my skin incredibly soft like a baby. I slather this on my whole entire body, spending extra time on my feet, legs and arms because that is where I tend to get dry. And it's always great for sensitive skin, so you will never have to worry about irritation on your face. And of course the new Eucerin Daily Protection Face Lotion is the perfect partner to the body lotion. Both also have SPF 30 so it works as a great sunscreen if you're going to be outside all day. I love it under my makeup because I feel my foundation holds much better with a good moisturizer underneath. I mostly use this at night on my dry spots, although they have been much better since I became part of the Eucerin network. My rosacea has faded away and I haven't had a flare up for a few months. I think Eucerin had a lot to do with this. Perfect for rosacea, eczema and dermatitis, Eucerin will work miracles on all skin types. 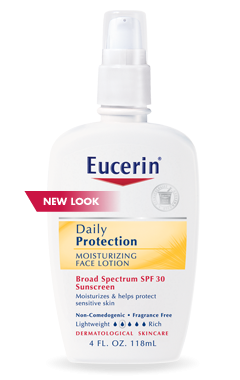 Eucerin's Daily Protection Body Lotion and Face Lotion is available at drugstores nationwide. I bought a Eucerin product for a co-worker who had severly dry and cracked hands (on her palms) and it worked great. I got an extra one for me and use it on my hands, elbows and feet. It's great stuff and this giveaway is awesome! The last item in the rafflecopter doesn't appear to be working but I did like your page on Facebook. And I've been trying to add you to Google Friends. I think it worked but it's not showing that I'm following. So I tried again. Hope it works this time. Thanks for the giveaway!